We’re only two-thirds of the way through the Asian saga, but all this talk about food has made me hungry. What about you? I think it’s time for a recipe. Since we’ve just been on the subject of Vietnam, how about we stop there and have dinner? I have Vietnam to thank for a few things, but one in particular stands out: it helped me get over my fear of cooking Asian food. It’s a bit embarrassing to admit, but I felt so out of my depth with food from places east for so long that – fusion and pseudo-Asian dishes aside – I could probably count the number of Asian things I’d attempted on two hands and one foot. First, there were all the strange ingredients to track down. Then there were all the unfamiliar techniques, most of which required equipment I didn’t possess (Wok? No. Steamer? No. Rice cooker? No; why can’t I just use a pot?). On the rare occasion that I mustered up the courage to, say, combine an envelope of Thai curry paste, a can of coconut milk and some veggies in a big skillet and let them stew for a while, the results were mediocre enough to make me wonder if some people just aren’t born with the ability to cook Asian food. Eventually, I all but stopped trying; more fish sauce and rice vinegar ended up in the trash each time we moved than ever made it into our mouths. Then, one night at dinner in Saigon I was halfway through my bowl of noodles when I was struck with an epiphany: although everything on the table was extraordinarily delicious, it was also so simple! The dish I was eating, for example, was just some seasoned, grilled meat, chopped veggies, fresh herbs and sweetened fish sauce enhancing a pile of boiled rice vermicelli. Not only were they all things I could easily find back home (with the exception of a few of the herbs, maybe), but the dish’s entire preparation was laid out bare for me to see in my bowl. It made sense; I could wrap my head around each and every ingredient, why it was there and what had been done to it. I sat back thinking in amazement: I could make this! Turns out I was right – on both counts. Not only did I make that noodle dish – enough times by now to know it like the back of my hand, but we’ll get back to that in a minute – I’ve been dipping my toes into wider Asian waters as well. Using fresh chilies, candlenuts, belacan and shallots I made a fish sambal the other night that nearly made me weep with joy (though the chilies may have also been responsible). A few nights before that I braised some chicken in a sauce with lemongrass, palm sugar and black pepper. I’ve now got a ready supply of galangal and fresh coconut in my freezer, two kinds of shrimp paste in my fridge and four kinds of non-Italian noodles in my pantry. The neighbors are probably reeling from all the pungent new aromas wafting through the floorboards. 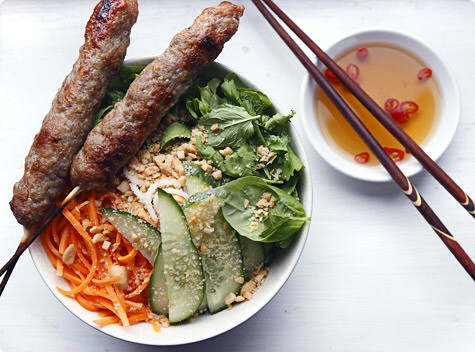 But back to the recipe I want to share, the iconic bun nem nuong, rice vermicelli with grilled meatballs. I’d had a version of this dish once before and been left totally underwhelmed; the meat was bland, the noodles were bland, the drifts of chopped lettuce, cucumber and beansprouts were, well, bland. It took eating it at the source to understand what it’s supposed to be. A room-temperature tangle of chewy noodles topped with crusty sweet-salty pork, tangy pickles, crisp veggies, zingy herbs, crunchy peanuts, rich scallion oil and pungent nuoc cham, it’s a dish that when done right comes alive in your mouth, each bite more exciting than the last. It’s light yet satisfying, simple yet complex, and full of all the hot-and-cold, sweet-and-sour, soft-and-crisp contrasts that make Asian food so incredible. It’s one of those dishes that makes you wonder why humans ever bothered inventing anything else to eat. And the news only gets better: not only can all the ingredients be found in your average supermarket, you need zero specialty equipment to make it (apart from some skewers if you want to grill the meat), and on top of that, the stink factor is practically nill (which should keep your neighbors happy). There’s a reason we’re eating this at least once a week, and if you’re not already, I have a hunch you may be soon too. If only I’d taken a trip to Vietnam years ago. Just think of all the bottles of fish sauce I wasted! Speaking of which, I need to remember to pick up a new one tomorrow; for the first time ever, I’m almost out. Don’t be scared by the length of the recipe! Trust me, it’s neither time-consuming nor difficult; there’s just a few components to assemble. The pickles and sauces are mostly just stirred-together affairs. The meat can be mixed up in less than five minutes (though afterwards it does have a sit a while in the fridge), plopped into little mounds on a baking sheet and shoved under the broiler. Or you can light the grill and give them a lick of live fire which makes the whole thing even better. Apart from that it’s just vegetable-chopping, herb-plucking and noodle-boiling. And since everything but the meat is meant to be served at room temperature you can make it pretty much as far ahead of time as you like. Then at serving time, all you do is pile it into a big multicolored, festive mound in your bowl and dig in. p.s. One trick I’ve discovered is to grate cloves of garlic on my fine microplane whenever smashed or pressed garlic is required. It’s much easier than pounding in a mortar, and as a bonus, rubbing the steel grater under running water to clean it removes any trace of garlic smell from your fingers! For the pork, knead all the ingredients together in a bowl until well-blended. Refrigerate at least an hour to allow the flavors to blend and the meat to firm up. If you’re planning to grill, put some bamboo skewers in water to soak. To make the pickles, peel the carrots and daikon and either julienne with a julienne slicer/mandoline (preferable) or grate them on the large holes of a box grater. Mix together the warm water, vinegar, sugar and salt. Stir until everything dissolves and add the carrots and daikon. Let stand for at least an hour. Drain the portion you’re using well; keep what you don’t use in the brine. To make the nuoc cham, with a mortar and pestle pound the garlic and fresh chiles to a paste. Or mince them together very finely with a knife. Or leave the chili in slices and grate the garlic using a fine microplane (my choice!). In a small bowl, combine the garlic and chili with the hot water and sugar. Stir well. Add the fish sauce and lime juice. Let stand for at least 15 minutes before using. For the scallion oil, in a small saucepan heat the oil over medium heat until shimmering. Add the scallions and fry, stirring constantly, until they soften and collapse, about one minute. Remove the scallions and oil to a bowl and let cool. Fill a large pot with warm water and submerge the rice noodles. Let them soak for at least ten minutes. Longer is fine too. Set the pot with the noodles over high heat and bring to a boil. Boil until the noodles are al dente, just like Italian pasta. Drain the noodles well in a colander and rinse with cold water to stop the cooking. Let them sit in the colander for at least 20 minutes, until they’ve dried somewhat and gotten slightly sticky to the touch. Tossing them around a few times to expose them to the air helps. Depending on whether you’re grilling or broiling the meat, preheat your grill or your broiler to its highest setting. For grilling, with lightly-oiled hands take handfuls of the meat and shape into long sausages around the skewers (about an inch/2.5cm in diameter), leaving at least an inch of skewer free at the bottom. If the meat seems very soft, refrigerate the skewers for 20 minutes or so after forming to firm them up again. Grill, turning as needed, until the meat is cooked through and brown on all sides. Before serving, cut each sausage into bite-sized pieces. If you’re broiling, line a baking sheet with foil and lightly oil it. Drop spoonfuls of the meat (2-3 tablespoons for each) onto the sheet, fitting on as many as you can without allowing them to touch. With an oiled hand, slightly flatten each into a patty to about a 1/2-inch (1-cm) thickness. Broil until golden brown, about 10-12 minutes. In the meantime, chop the lettuce and cucumber, pluck the herbs from their larger stems and set all the toppings out in bowls. Divide the noodles between serving bowls. Top with a portion of the meat, then some of each of the garnishes. You can either assemble each bowl before serving or set everything out on the table and let people build their own. I do a little of each, arranging some of each component on top of the noodles and offering more at the table for people to customize. However you do it, the last thing to do it drizzle a spoonful or two of both scallion oil and nuoc cham over the top, mix it up and dig in. Any leftover pickles, nuoc cham or scallion oil will keep for a couple weeks in the fridge. I've never tried this at home, but you might inspire me…thanks for making it seem do-able. I'm glad you find your way to make Asian food more accessible for you. It is truly not as difficult as it may seem, and it looks like you have all the basic ingredients covered in your kitchen. Great posting as usual, Melissa! I think this will be Sunday dinner tomorrow! Thank you Mellissa! Mmm, I can not begin to tell you how much I am craving this dish right now. It sounds so good. I love Vietnamese food but I usually wimp out and go to my local and have someone else cook it for me. But your recipe I will print right this moment and try! Salivation! This looks amazing? Quick question: Where do you find galangal and shrimp paste? This dish looks so tasty I am a HUGE fan of Chinese, Vietnamese, tai cooking. The meat looks crisp on the outside but then tender on the inside. I also love your home made sauce, at first glance I thought it was fish sauce with a sprinkle of chillies. Great post. When can we expect Part 2 ;)? I don't like much how the food is being presented but sound yummy…. It is obviously one of the complete meals that I have ever seen in blogs. Meat is the, vegetable and even pasta very amazing. The preparation might be a little difficult but looks worth it. I'm so glad you began the recipe by stating that it's easier than it looks at first glance. I made this last night with delicious results. I used 1/2 pork and 1/2 chicken for the sausage and broiled the patties. All the flavors went together so wonderfully. Thanks for inspiring me to try something new! I love eating Vietnamese food at restaurants, but it feels good to know I am capable of having it at home.